To study the present state and economic importance of the natural vegetation of India, it is necessary to note the distinction between flora, vegetation and forest. Flora refers to plants of a particular region or period, listed as species and considered as a group. Vegetation, on the other hand, refers to the assemblage of plant species living in association with each other in a given environmental frame or ecological frame. Finally, the word forest is used, often loosely, by administrators and the general public to denote a large tract covered by trees and shrubs. Most of our Himalayan and peninsular areas are covered with indigenous or endemic flora, while the Indo-Gangetic Plain and the Thar Desert contain plant species that generally come from outside, or are exotic. ‘Nearly 40 per cent of the plant species found in India are exotic. These exotic plants have, come from various locations around the world. Those known as boreal have come from the Sino-Tibetan area. The palaeo- tropical have come from the neighbouring tropical regions. The arid and semi-arid vegetation cover of the Thar Desert and the western margins of the Gangetic Plains have been influenced by the plant species from North African regions. Those plant species coming from Indo-Malaysia have influenced the vegetal cover of the hilly regions of north-east India. Much of the plant cover- is in a degraded state—. i.e., low in quality and content. The natural vegetation refers to a plant community that has been left undisturbed over a long time, so as to allow its individual species, to adjust them to climatic and soil conditions, as fully as possible. While studying the vegetation types, the focus is on the dominant species, their appearance, adaptation, form, mutual association and stages of growth to reach a climatic climax. 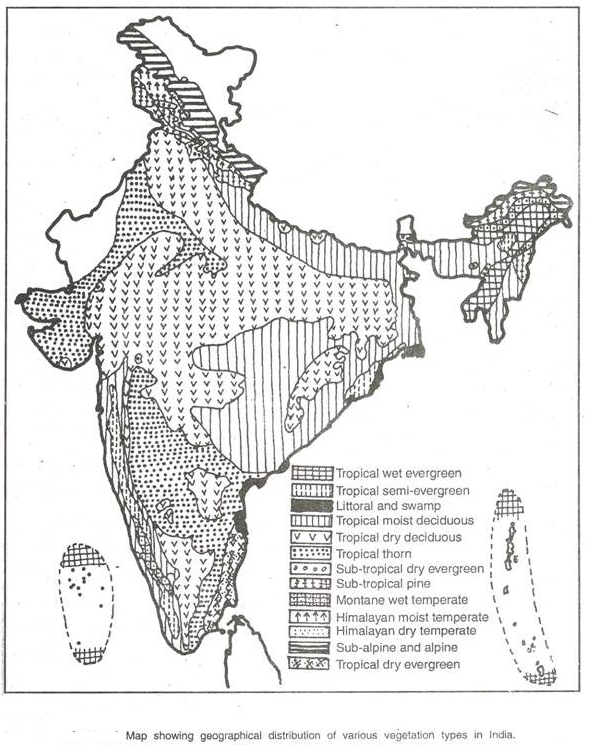 The following classification of natural vegetation in India, which divides the Indian vegetation into five types and fifteen sub-types, is based on studies by H.G. Champion, Schweinfurth, Carl Troll and G.S. Puri. These forests occur in areas having more than 250 cm of rainfall annually. The best evergreen forests are found in areas with over 300 cm of annual rainfall and a short dry season. This belt is bounded by semi-evergreen forests on the drier margins, which in turn merges with the tropical moist deciduous forests. The general spatial distribution of tropical wet and semi- evergreen forests covers a strip along the Sahyadris (up to a height of 1,370 m) and large areas in north-eastern India (up to a height of 1, 070 m) and Andaman and Nicobar Islands. These are very dense forests with little undergrowth. Trees reach 45 m in height. There may be associated patches of canes, palms, bamboos, ferns and lianas which are found along breaks in the vegetation, for instance, along stream banks. These forests have a very rich diversity of vegetation—the Sahyadris with evergreen species, and in Assam, the semi-evergreen diversity is very much pronounced. Some important species in these forests include rosewood, aini and telsur in the Sahyadris; champa, toon, and gurjan in Assam, Meghalaya and West Bengal; ironwood, ebony, simar, pyinkado and laurelwood over an extensive area. The timber produced in these forests is fine­grained and of a durable quality. Besides, these forests give valuable products of immense economic importance, like bamboo, cane, etc. Since the dry deciduous is actually a variant of .the moist deciduous type, both of these are ‘discussed together (dry deciduous is otherwise listed under Dry Tropical Type). Both the deciduous forests together cover an extensive area bounded by the Himalayas, Thar Desert and Sahyadris— having a moderate rainfall between 100 cm and 200 cm annually. Within this area, the moist deciduous forests are found in a strip along the Sahyadris, covering most of Orissa, eastern Madhya Pradesh, Chhotanagpur Plateau and a strip along the Shivaliks. The remaining area in this zone, covered by dry deciduous types, receives 100-150 cm of rainfall in a year. The moist-deciduous trees shed their leaves during the hot and dry season. They have dense undergrowth. The dry deciduous forests have a more open and dwarfish composition—the trees being more stunted and widely spaced. The species in both cases are more or less the same. The deciduous forests are of immense economic importance. Some of the well-known varieties of trees include sal, teak shisham, sandalwood, rosewood, hurra, myrobalan, rilahua and khair. These are specialised tropical trees. The tidal coasts of India are lined with mangrove vegetation—which grows in brackish as well as fresh water. The seaward fringes, channels and islands of the deltas of the Ganga, Mahanadi, Godavari and Krishna are lined with belts of dense tidal forests. Along the west coast, mangroves are found along river creeks. The mangrove vegetation tolerates relatively high levels of salinity. The tree trunks are supported by stilt-like roots which get submerged under water at high tide. Mangroves stabilise the shoreline and act as a bulwark against encroachment by sea. The great Sundarbans delta is covered by the sundari tree. Other species include screw pines, canes and palms. Tropical Dry Evergreen Forests This vegetation type is confined to coastal Tamil Nadu, an area which receives about 100 cm of rainfall annually (mainly from retreating monsoons, between October and December). Large areas with this type have been cleared for agriculture, but wherever they exist, they have closed but low canopy of grasses and shrubs. This is a vegetation type which covers extensive areas in northern and north-western part of the country and along the leeward side of the Sahyadris. An open stunted forest, which gradually degenerates into desert shrubs and grasses westwards, characterises this vegetation type. Biotic changes are mainly responsible for the development of tropical thorn forest. Excessive grazing of savanna and dry deciduous forests has often resulted in tropical thorn forest. This vegetation type covers a wide variety of species on account of edaphic (soil-related) factors. The tree varieties common to this type include acacia of different types, neem, shisham, khair, pipal, ber, babool, bamboo and khardhai. The western margins of this type of vegetation in the north-west of the country merge with sandy wastes of the Thar Desert which has extremely sparse and thin vegetation cover. This type of vegetation is found up to 1,500 m height in Nilgiri and Palni hills in the south, higher slopes of the Sahyadris and summits of the Satpura and Maikal hills. These forests occur above 1,500 m height on the south Indian hills of Nilgiri, Annamalai and Palni and are locally known as sholas. Shola forest is dense but low with much undergrowth and many epiphytes, mosses and ferns. The common tree varieties in this type include mognolia, laurel, rhododendrons, elm, prunus, etc. The vegetation undergoes changes along the Himalayas depending on altitude, latitude and aspect. As a result, the vegetation types are different on the lower and higher slopes, as well as in the western and the eastern sections of the Himalayas. This type of vegetation is found in eastern Himalayas between 1,000 m and 2)000 m height. Climbers and epiphytes may occur along with evergreen oak, chestnut, ash and peach. This type of vegetation occurs a little west of the wet hill forests at similar altitudes, between 73°E and 88°E longitude, and in some areas in the north­east (Khasi hills in Purvanchal). Chir is a common tree variety of this vegetation type. This type of vegetation occurs in a narrow belt in the Himalayan foothills, receiving 50-100 cm of rainfall annually. This forest is more like the Mediterranean shrub. Wild olives, Acacia modesta and pistacia are the important tree varieties. This vegetation type covers extensive areas in the entire Himalayan belt at altitudes between 1,500 m and 3,000 m, receiving between 100 cm and 250 cm of rainfall annually. In the east Himalayan zone, this vegetation is in the form of broad-leaved evergreens. Important tree varieties include pine, cedar, silver fir, spruce, deodar with some undergrowth of oak, rhododendrons, laurel and some bamboo. This vegetation type occurs in inner Himalayan ranges where the rainfall is below 100 cm. It is an open and xerophytic forest with deodar, juniper and chilgozah. On limestones and steep slopes occurs cypress and in riverine areas is found alder. Alpine forests are found in the Himalayan ranges between 3,000 m and 3,500 m altitude as a dense shrubby forest. The Alpine forest degenerates into a low evergreen scrub, on the southern slopes and a dry xerophyte vegetation on the northern slopes of the Himalayas. Important tree varieties include silver fir, juniper, pine, birch and rhododendron.